Since 1986 the VSA has sponsored workshops in conjunction with Oberlin College in Oberlin Ohio. The workshops, offered every summer, offer an outstanding and important opportunity for violin and bow makers to learn methods and subtleties associated with fine stringed instruments and bows. The original Restoration Workshop was created by the noted restorer Vahakn Nigogosian. Today there are six programs held during the summer, which offer in-depth instruction by a distinguished faculty supplemented by renowned luthiers. 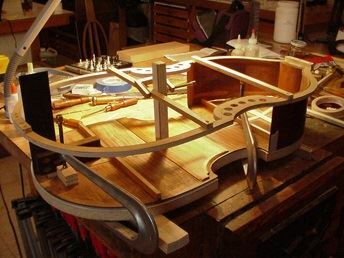 The current programs are: Violin Making (advanced professional); Bow Making (advanced professional); Restoration; Bass Making (advanced professional); and Acoustics. For exact programs, please review below. Please feel free to submit your REQUEST TO BE CONSIDERED for the 2019 Workshops by March 1. Bass Workshop inquirers should NOT complete the form, but contact Jay VandeKopple directly. CLICK HERE FOR THE INQUIRY FORM (Notification of acceptance to be sent mid-March/April).